Andropogon scoparius, Arabis lyrata, Artemesia caudata, Asclepias tuberosa, Euphorbia corollata, Helianthemum canadense, Helianthus divaricatus, Koeleria cristata, Lespedeza capitata, Liatris aspera, Lithospermum croceum, Oenothera clelandii, Panicum oligosanthes, Pteridium aquilinium, Quercus velutina, Rhus copallina latifolia, Rosa carolina, Smilacina stellata, Tradescantia ohiensis, Viola pedata lineariloba, Vitis riparia. Herbaceous perennial to 2'. Leaves palmate compound; leaflets oblong lanceolate, slightly hairy, to 2" long. 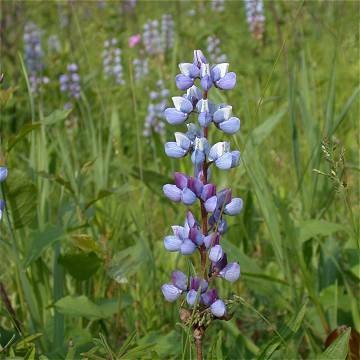 Flowers blue to blue-violet, pea-like in an upright, elongate, terminal cluster. Fruit a hairy pod to 2" long; seeds smooth, brown and spotted. Flowers late April to late July. A beautiful plant that prefers sandy soil in partial sun. The larval food plant of the endangered Karner Blue Butterfly.